Cartwright’s Market is a traditional, yet vibrant delicatessen that uses local ingredients to make in-house products that are the pinnacle of freshness. We are proud to serve Grants Pass and the surrounding area, forming great community bonds, as well as being a favorite establishment for those passing through. 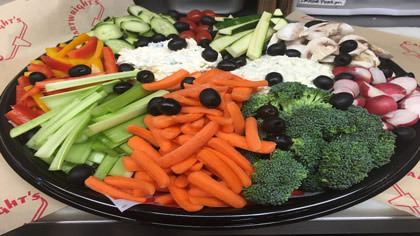 Whether looking for a snack, meal, fresh groceries or hosting a whole party, Cartwright’s is there to meet your needs. Our homemade smoked meats and cheeses are legendary in the area, but we also feature fresh produce and vegetables for all your grocery needs. From seafood to BBQ to smoked sausages, Cartwrights is the delicatessen for quality food at reasonable prices. We give our cheeses the same care and attention that we give our meats! Some exclusive cheeses offered include triple creme’s & blues. Most people have tried parmesan, but they haven’t really had parmesan until they have sampled ours, cut right off the block. Buy some for the whole family or check out our sandwiches for fantastic bread and meat pairings. We don’t rush our specialty meats, but rather smoke and flavor them until they exceed our high standards. Sausage, jerky, and pepper sticks are all made in-house using decades-old, time-tested recipes. 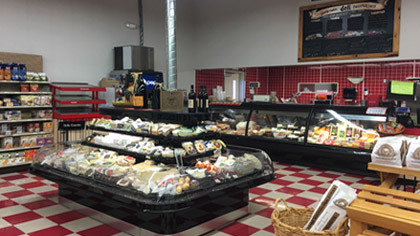 Specialties include Italian dry wine salami, Lebanon bologna, and fresh, thin-cut deli meats. Chops, chuck, ribs, and bacon are also available for individual purchase or in bulk for a reduced price. Fans of our delicious meats and cheeses should visit our restaurant location at Cartwright’s Kitchen and Grill. Here, we are happy to offer order-made sandwiches and more for lunch or dinner. Cartwright’s is known for its attention to detail, which can be witnessed in the perfect sandwiches. We also carry a selection of burgers, BBQ, soups, and salad.